The president of Bombardier Aerospace Guy Hachey was received Tuesday by King Mohammed VI in Rabat palace. 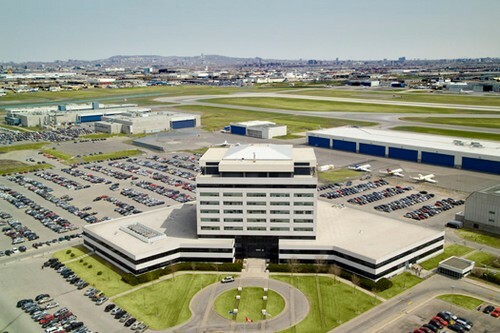 The Canadian group in Morocco announced imminent start of construction work of buildings of Bombardier in Nouaceur. The implementation of Bombardier Aerospace in the province of Nouaceur has evolved . President of the Canadian group, Guy Hachey, was received in audience by the royal sovereign of Rabat Mohammed VI. The meeting was attended by the Minister of Industry, Trade and New Technologies, Abdelkader Amara, and the head of the North Africa region in the Bombardier group, Souad Elmallem. Bombardier Aerospace has signed on 18 June, an agreement with the Moroccan society Midparc Investment SA, specializing in property management for the acquisition of land Midparc ’Casablanca Free Zone Nouaceur to locate his buildings in the kingdom. "The choice of location of our bulding at Nouaceur is an important step in the installation in Morocco, of Bombardier Aerospace," Said Guy Hachey on Aeronautique.ma. "This site meets our stringent requirements and our high standards, and we are excited to begin the construction and production of the first Bombardier aircraft components manufactured in Morocco," he says. The start of construction work is expected to begin during the second half of 2012. The first Bombardier aircraft components "Made in Morocco" will be ready in 2013. Despite the current economic situation in the world, Morocco reaffirms its ability to attract foreign investors. Bombardier Aerospace, which is present in Canada, the United States, Mexico and Ireland, has invested nearly $ 200 million over eight years. In total, 850 skilled jobs will be created by 2020. "The number of companies operating in the aviation sector has increased from 10 to 100 between 2001 and 2011, the volume of exports has increased a great way to reach a billion dollars," said Ahmed Fassi Fihri, Director investment Moroccan Agency for Investment Development. • Nigeria: Rebels resume oil attacks?